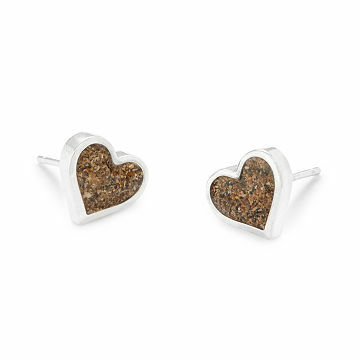 Wear a reminder of the shore that holds a special place in your heart with these evocative earrings. Wear a reminder of the one shore that holds a special place in your heart with Holly Daniels Christensen's evocative earrings. The sterling silver bezels display a pinch of granules gathered from your choice of one of thousands of beaches around the world. Select your favorite beach from the artist's Sand Bank, or send in sand you've collected from an unforgettable spot. Whether you're partial to the island you call home, your family's favorite summer vacation spot, or the shores where you took your wedding vows, this pair keeps your most cherished beach memories on hand. Handmade in Massachusetts. If you"d like to use your own sand, we"ll send you a convenient mailer with instructions. You can polish your earrings with a silver polishing cloth then use a soft cloth or brush with soap and warm water to remove the polishing residue. If the "sandy" part of your earrings becomes scratched or cloudy, buff with car or boat wax. My sister was so amazed and pleased! You guys make giving meaningful gifts very easy and unique! Like the idea for having sand from a special place. Was a great memory gift.